The processing-microstructure-property relationships in steels continue to present challenges to researchers because of the complexity of phase transformation reactions and the wide spectrum of microstructures and properties achievable. This major two-volume work summarises the current state of research on phase transformations in steels and its implications for the emergence of new steels with enhanced engineering properties. Volume 2 reviews current research on diffusionless transformations and phase transformations in high strength steels, as well as advances in modelling and analytical techniques which underpin this research. Chapters in part one discuss the crystallography and kinetics of martensite transformations, the morphology, substructure and tempering of martensite as well as shape memory in ferrous alloys. Part two summarises research on phase transformations in high strength low alloy (HSLA) steels, transformation induced plasticity (TRIP)-assisted multiphase steels, quenched and partitioned steels, advanced nanostructured bainitic steels, high manganese twinning induced plasticity (TWIP) and maraging steels. The final two parts of the book review advances in modelling and the use of advanced analytical techniques to improve our understanding of phase transformations in steels. 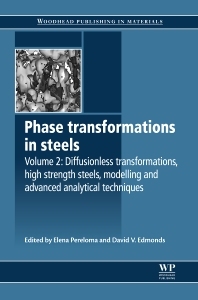 With its distinguished editors and distinguished international team of contributors, the two volumes of Phase transformations in steels is a standard reference for all those researching the properties of steel and developing new steels in such areas as automotive engineering, oil and gas and energy production. Scientists, metallurgical engineers and senior technicians in research and development laboratories, designers and fabricators, as well as academics and students. Elena Pereloma is Professor of Physical Metallurgy and Director of the BlueScope Steel Metallurgy Centre at the University of Wollongong, Australia. David V. Edmonds is Emeritus Professor of Metallurgy at University of Leeds, UK. Both have made major contributions to steel research.